We are an international couple who met in a guesthouse in Osaka in 2009 over a love of pilgrimage. Our passion for Shikoku and the 88 temple pilgrimage led us to start a guesthouse in the Dogo area of Matsuyama. 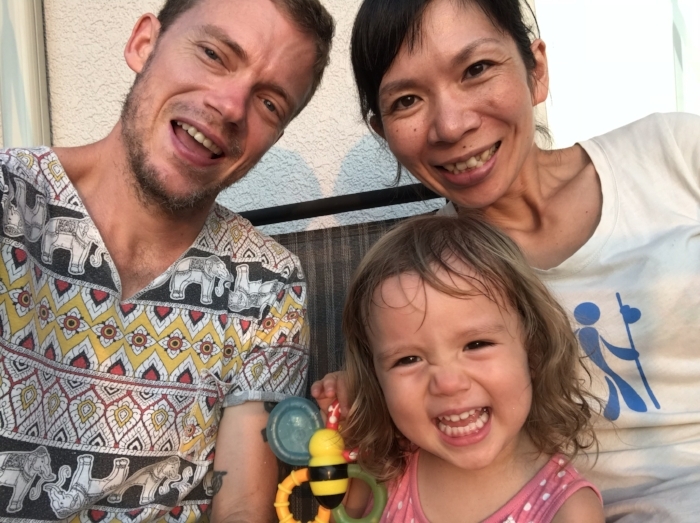 After running Sen Guesthouse for 6 1\2 years, we decided that we wanted to live and raise our daughter in a more rural environment while still holding a connection to both Shikoku and pilgrimage. Shodoshima checked all the boxes for us, and though it took many years to find the perfect spot on the island, it was well worth the wait because we have indeed found our new home. We are now super excited to host both old friends and new faces here and are happy to help people really experience this wonderful island. Hi, I’m Nori. I’m from a small town in Kagawa, but I lived in Osaka for more than 10 years before we moved to Matsuyama in 2012. Since I went to New Zealand and worked in hostels, I’ve been thinking to have my own guesthouse such as everyone feel “their own home”, so I worked in a guesthouse in Osaka for 4 years. I walked the 88 temple pilgrimage because I wanted to know about my hometown Shikoku more. Every time when I walked as “Ohenro-san (people is called like it when they walk the 88 temple pilgrimage)”, always I was surprised and impressed that such a great culture has been kept, not only temples but also people’s thought. So, we were so happy to introduce everyone about 88 temple pilgrimage and all guests who walked it came back also loved it and Shikoku. Now we are in Shodoshima, a part of Shikoku, ready to make more lover of Shodoshima and Shikoku 88 temple pilgrimage, enjoying our life in such a beautiful island. My name is Matthew and I’m an American from the southern border of Texas and Mexico. All through life I always had a passion for religion and and different cultures and when I went to university, that’s exactly what I studied. Another passion of mine is traveling and I spent a good portion of my 20′s seeing the world, teaching English, lying on beaches and trampling on ruins. Where these 2 interests combine is pilgrimage. After completing some of the world's most important walks, I want to help others get a glimpse of this part of life. Our 6 years in Matsuyama were partly devoted to giving advice and instruction on how to walk the 88 temple pilgrimage in Shikoku. Now that we've made the move to Shodoshima, we would like to spread the word of Shodoshima's own 88 temple pilgrimage.